Posted By:Unknown | At:10:21 PM Be the first to comment! BOSTON — Members of a coalition of Massachusetts women's groups on Wednesday disputed Mitt Romney's assertion that he requested the names of potential female candidates for high-level, state positions when he was elected governor. "To be perfectly clear, Mitt Romney did not request those resumes," Jesse Mermell, a former executive director of Massachusetts Government Appointments Project, told reporters during a conference call arranged by the Democratic Party. Democrats arranged Wednesday's call to help blunt the Republican's efforts in the final weeks of the presidential campaign to appeal to female voters. Polls show women favoring President Barack Obama over Romney. Romney, responding to a question during Tuesday night's presidential debate about equal pay and opportunities for women, said that in the process of assembling a cabinet as governor he was disappointed to find that most applicants were men. He said he then asked women's groups for help finding qualified female candidates. "I went to a number of women's groups and said, `Can you help us find folks,' and they brought us whole binders full of women," Romney said. The "binders full of women" remark sparked an instant wave of social media parodies of the phrase. Mermell, a Democrat and town official in Brookline, Mass., said Romney did not request any names after his 2002 election. Instead, she said MassGAP approached Romney's team as part of its effort, begun before the election, to make sure that more women were appointed to senior positions in the new administration. MassGAP describes itself as a nonpartisan coalition of women's groups interested in boosting the number of women in top state government jobs. The coalition said it approached the nominees of both major parties after the primaries, Romney and Democrat Shannon O'Brien, and secured commitments from both that, if elected, they would work with the organization to identify potential female candidates for senior-level positions. Romney's campaign declined to respond to Mermell and referred questions to Kerry Healey, who was Romney's lieutenant governor. Healey said Romney went beyond the initial contact with MassGAP by reaching out to acquaintances in the business world and others to help meet his pledge to fill more administration posts with women. Healey served as a liaison to MassGAP and reviewed the binders with resumes of potential candidates. "Gov. Romney not only supports equal pay for equal work, but he goes beyond that by working to support women to reach the highest levels of government," Healey said. Mermell questioned Romney's commitment to helping women get ahead in the workplace. "The fact that he needed our help says everything you need to know about his true commitment to advance women in office," she said. Mermell added that it was "shocking that after 25 years of professional experience at the very highest level of corporate America, Mitt Romney needed our help." In a statement, MassGAP said the number of women in senior-level posts climbed from about 30 percent to 42 percent during the first two years of Romney's administration. A 2004 survey by the State University of New York found Massachusetts was first in the nation in the percentage of women in top state positions. MassGAP, however, noted the percentage later dropped to 25 percent in Romney's final two years in office. "The way it worked was not quite the way it was described last night," said Ruth Bramson, who was hired as Romney's chief human resource officer after her resume was spotted in a binder. "He was half-right." "Governor Romney was a tremendous proponent of bringing women into the state. There's no doubt about it," Bramson said. 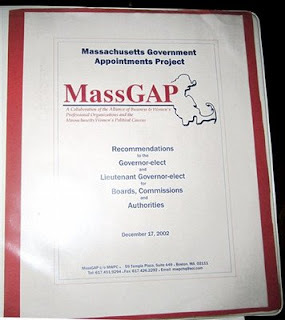 "But the impetus for this was not Governor Romney, but this other organization, MassGAP."